Golf was first played on the original site at Northumberland in 1964 after four local golf enthusiasts raised the funds to establish a nine-hole country club. 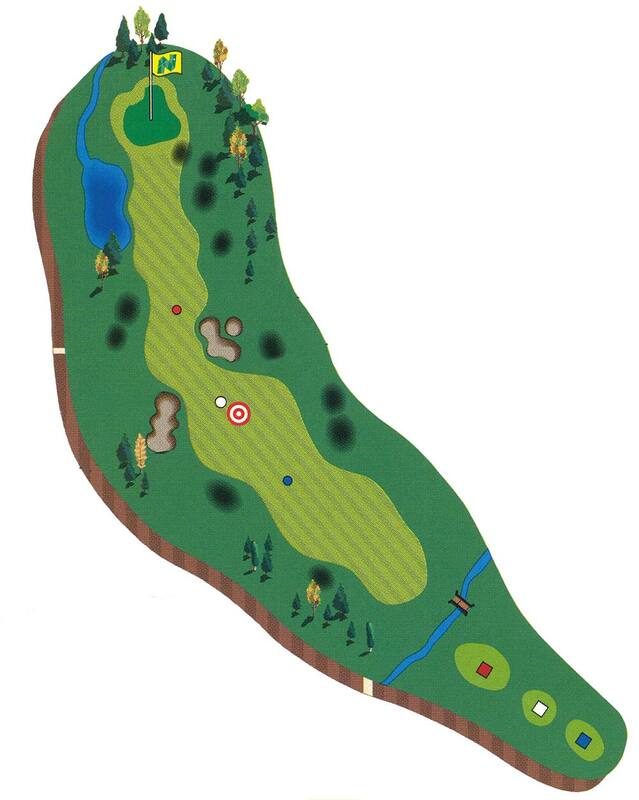 In 1988, the course was expanded and redesigned by Bill Robinson, from it’s original nine-hole course to the current 18-hole championship layout. The original nine holes were all given Gaelic names to honour the historic Scottish connections with the village of Pugwash. Over the years Northumberland Links Golf Course has played host to many of Nova Scotia’s prestigious Golf Championships. Our full-service clubhouse provides everything for a great day of golf: a well-stocked pro-shop and friendly, professional staff to get you on the course. With a complete kitchen and bar service, a dining room and large deck area, we can meet all of your needs. The banquet area can seat up to 80 people for catered events, corporate or group outings. 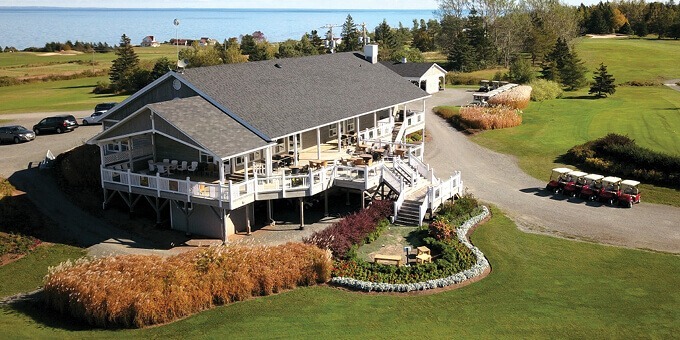 The Clubhouse’s hilltop location also provides fabulous views of several golf holes, the Northumberland Strait and all three Maritime provinces. Your Northumberland Links golf experience starts at our newly renovated Pro Shop. 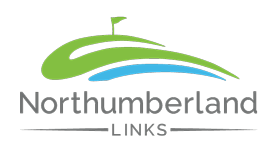 Our Pro Shop team, led by Director of Golf Bruce McIver, take great pride in delivering a true Northumberland Links experience. For first class golf instruction, we have CPGA Golf Professional Richard Dumeah and former LPGA competitor Heather Cameron available. 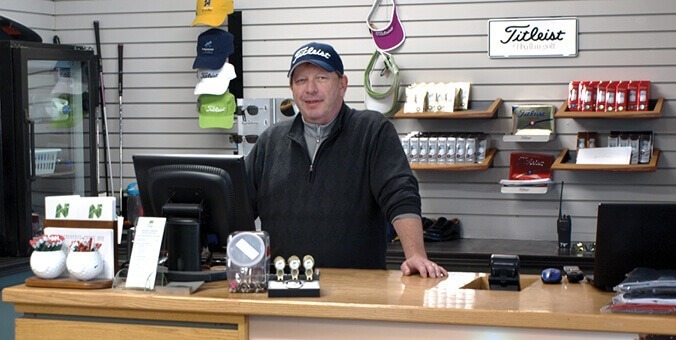 The Pro Shop also boasts a great selection of golf apparel and accessories from many of the leading brand names in golf, all at competitive prices. Be it souvenirs, gifts, impulse buys or a Northumberland Links gift certificate, we have you covered. The Northumberland Links Pro Shop can be contacted directly by phoning (902) 243-2808 or emailing: golf@northumberlandlinks.com. Over the years The Tap-In has become a must visit for anyone wanting the full Northumberland Links experience. Unwind with your favourite beverage from our fully stocked bar or try one of our great Northumberland Links signature meals. The Tap-In offers visitors and regulars alike the perfect environment, whether you are kicking off your round or wrapping one up, you can enjoy a spectacular view of the 18th from Tap-In’s large covered deck. If you are teeing off early in the morning or simply arriving early to hit the practice range or the putting green make sure you visit the Tap-In Express. Try one of the Tap-In Express’ speciality coffees or choose one of our delicious grab and go offerings. The Tap-In Express is designed to get you fueled up and out on the course quickly. 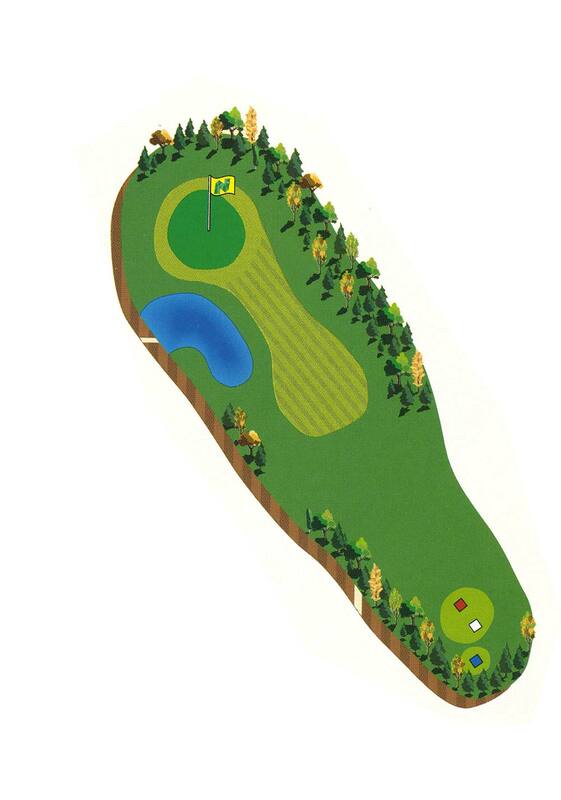 The aggressive tee shot is played over the trees on the left corner to leave a short 50-yard pitch to the green. However, many say the smart play is to hit to the top of the hill just short of the bunker leaving 130 yards to an open green. This hole should be an easy par to get your day off to a good start. The wind is always in your face here! Line up to the left side of the fairway and allow the hill to kick the ball to the preferred spot on the right side of the fairway. From here, be sure to leave your second shot a little short and right of the flagstick. Missing this green to the left is a difficult recovery. Trust the yardage. A drive left center of the fairway offers the best angle of approach to this subtle green, as it is well protected by mounds. 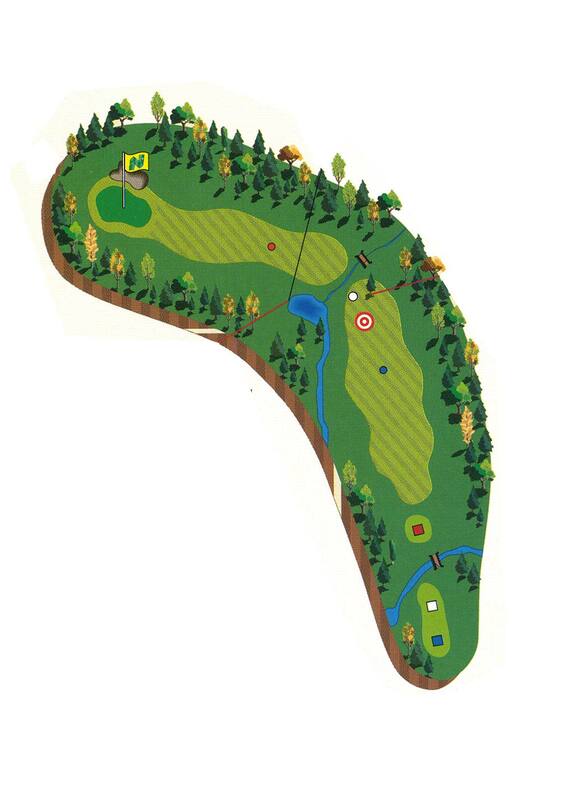 Avoid the temptation to take the short cut over the mounds on the right of the fairway as it can lead to a lot of grief. 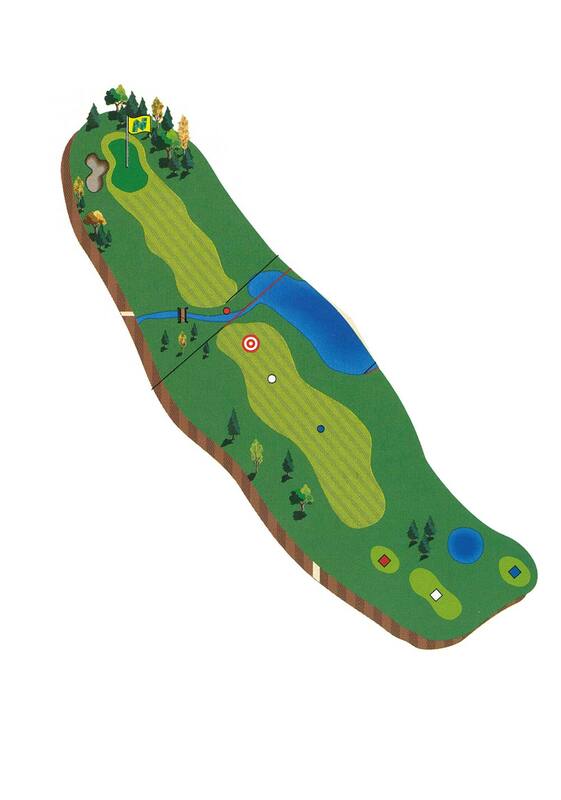 Some say the course really begins here with the approach shot on # 3 as it needs to be very precise and ideally takes one hop on to the green – be careful of the pond short and left. On Northumberland Links’ signature hole you can often see lobster boats harvesting their catch during lobster season within a wedge shot of the green. The old lobster boat behind the green is a good target for the tee shot as you want to play as far left as you dare to leave an uphill putt. The bail out shot to the right leaves a difficult pitch or putt. Par here is a great score and bogey won’t hurt you. 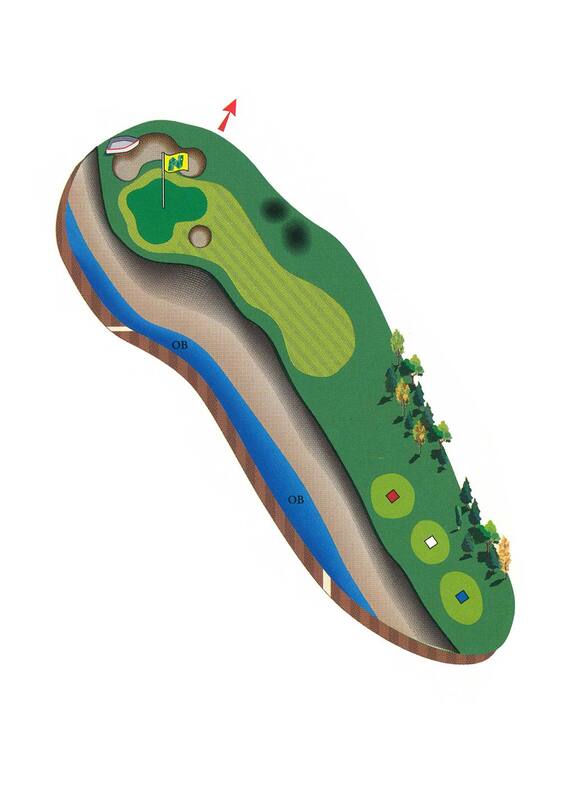 Named after the 18th century historic cemetery adjacent to the fairway, this par 5 demands accuracy and nerves. Use the straightest club in your bag and line up just right of the bunker. 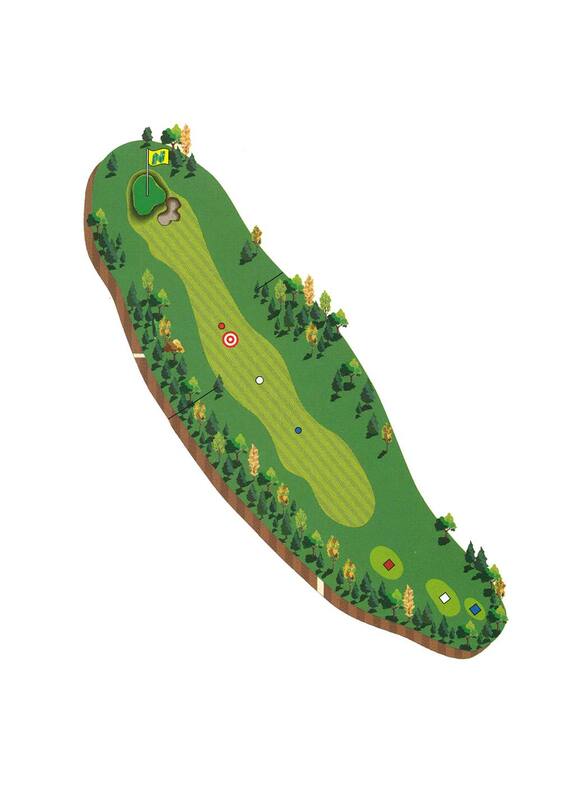 Play your second shot straight down the fairway avoiding the temptation to take the short cut over the fescue mound that guards the green. Putting on this green is a warm-up for the next hole. Club selection is critical on this short uphill par 3. 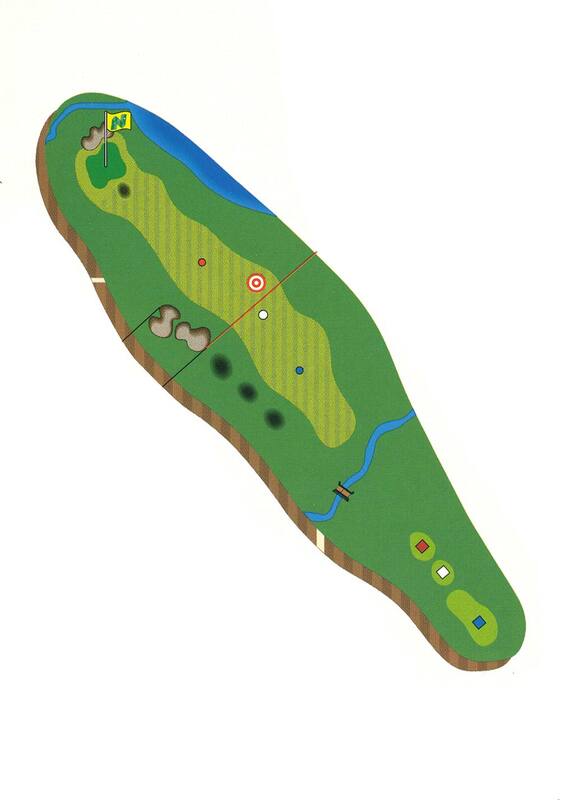 The three tiered green is the most treacherous on the course. You must be below the hole or par is only a dream. Pay close attention to the flagstick location. 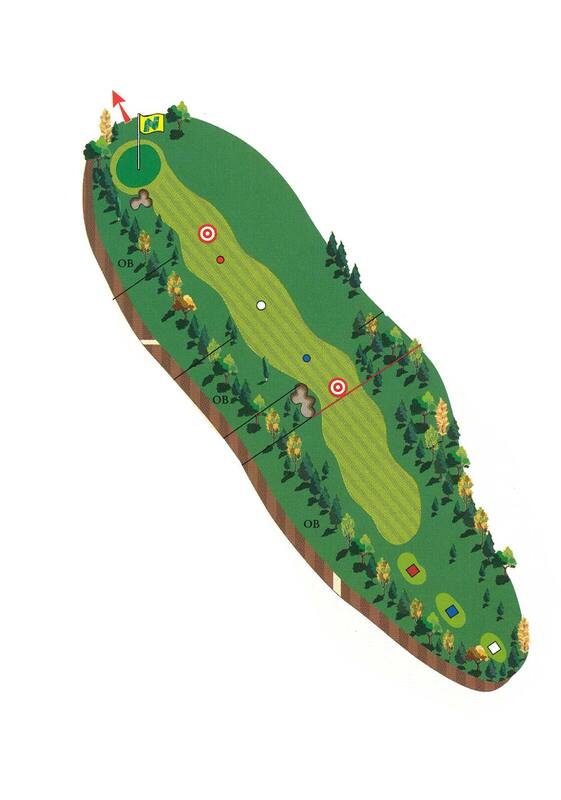 Named after the large maple tree that sits just left of the green, this par five is pretty straight forward but be careful of the OB on the left off the tee. A lay up to the 100 yard area leaves a very comfortable wedge over the front bunker. Birdie is a good possibility for the good wedge players. Be mindful of swirling winds. It’s a lot farther to carry the pond then it looks from the tee and for those who have the carry yardage, 225 yds, there is more room then you can see. 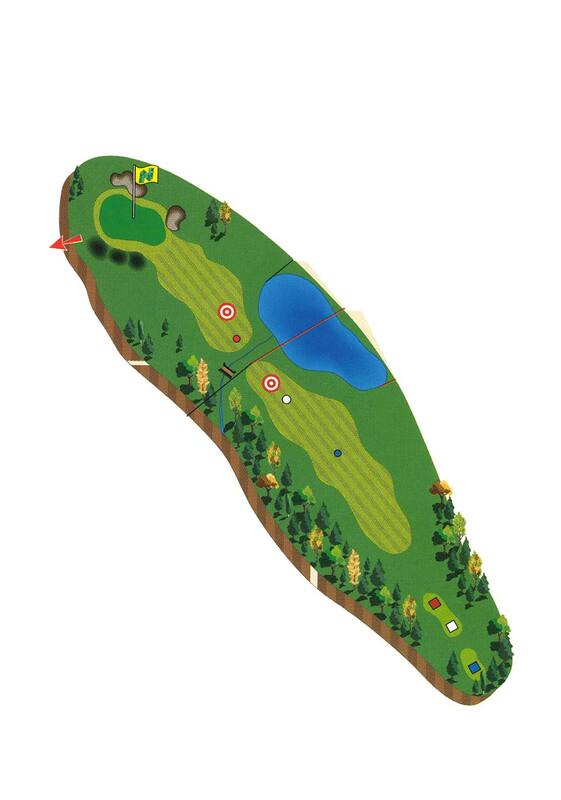 The smart play is to hit to the right of the pond with your 200 yard club leaving about 160 yards for the second shot. Named after the approach shot to this large green, trust the yardage and add one more for the wind. Do not miss the green left. It is extremely important to place your tee shot on the left side of the fairway cut to have any chance of holding this green. A long drive may leave you too close to have any chance of staying on this small elevated green. Do not let its short length fool you. Another “short monster”. 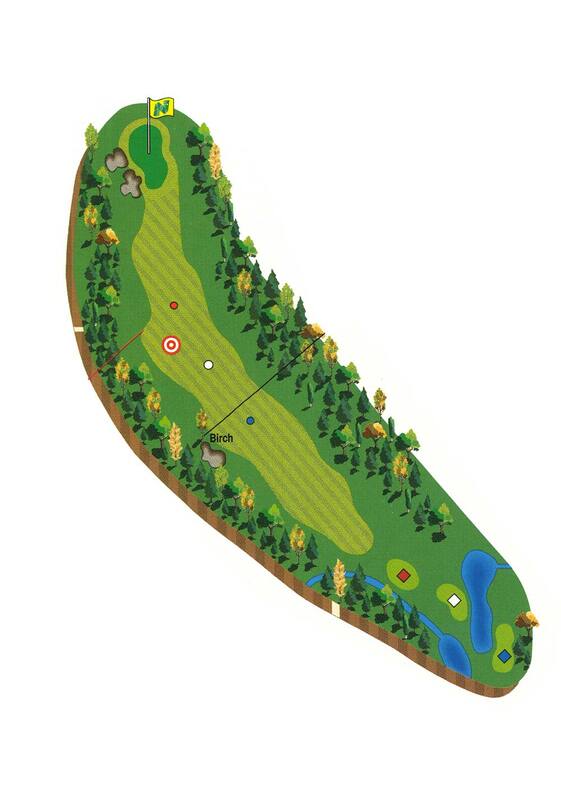 Depending on the length of your drive, you may play an aggressive tee shot down in front of the green leaving a 50-yard pitch or lay-up beside the pond leaving about 150 yards for the second. 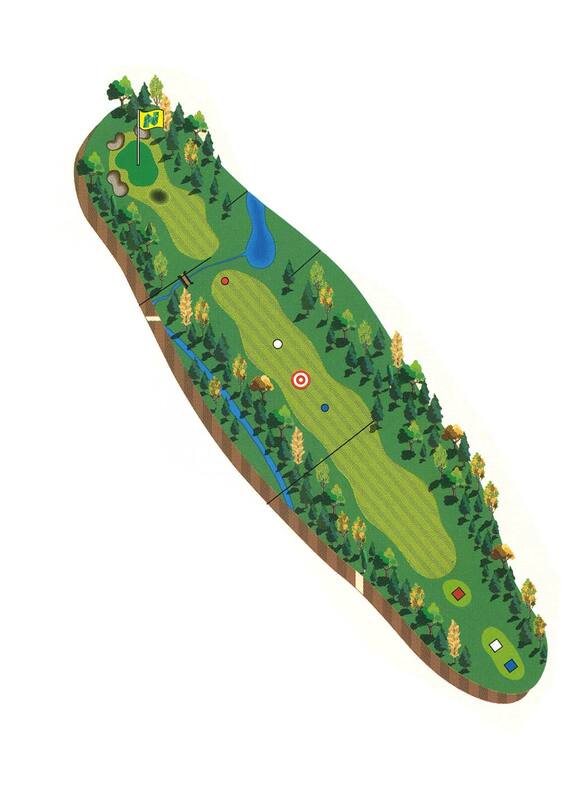 Play approach shot to the front left of the green and allow the ball to feed to the right on this sloping green. Par on this hole is an excellent score. 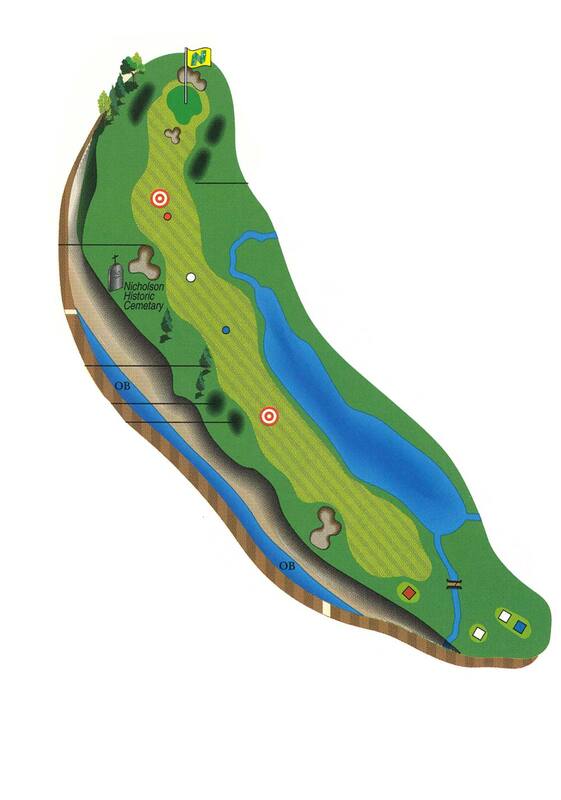 This par 5 plays much longer then its yardage with a steady head wind and a long uphill grade. The approach shot plays at least one club longer then the yardage. A lay up beside the left bunker will leave a wedge shot to this the largest green on the course. Many putts are left short on this green! Like #12 at Augusta, swirling winds place a premium on club selection on this innocent looking par 3 which is the smallest green on the course. The pond short and left manages to gather many victims of the swirling winds. Like the last hole, take at least one more club then the yardage would suggest. This is the only green on the course that slopes from front to back. To have any chance of holding it you must be in the fairway cut off the tee. Land your approach on the front right as this is the flattest part of the green. There is no “short cut” playing down the right side. This is perhaps the most challenging par on the golf course. You must be long and straight off the tee to have a chance to reach this tight undulating green, which is known for kicking balls off towards the 3 bunkers that protect it. The prevailing wind is always in your face here. 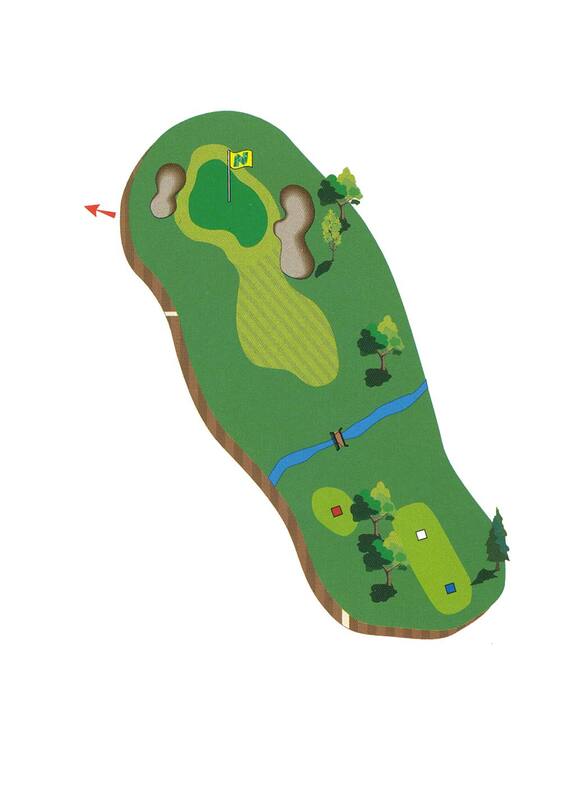 On paper, this is the easiest hole on the course as long as you avoid the OB all the way down the left side. The large flat green is an easy target to hit in two for the long hitters. 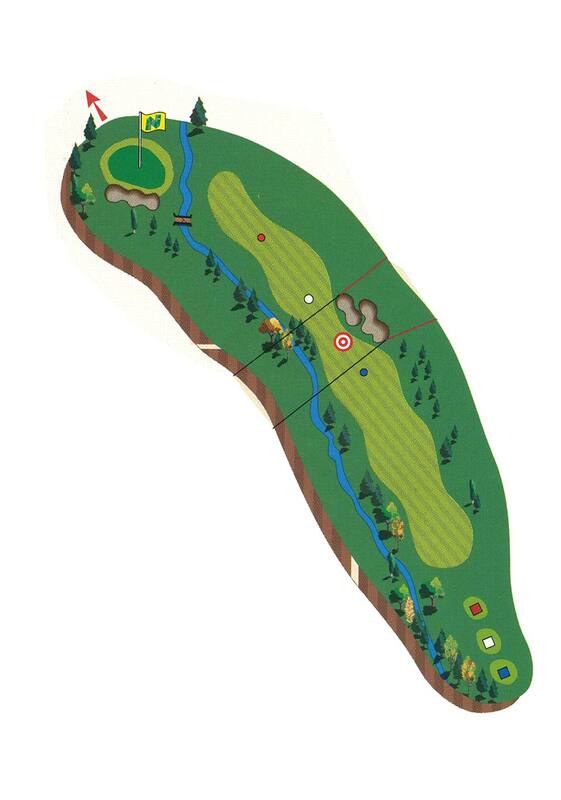 Look for a birdie here or even an eagle chance. Do not let the panoramic view of PEI distract you on this very demanding par 4. 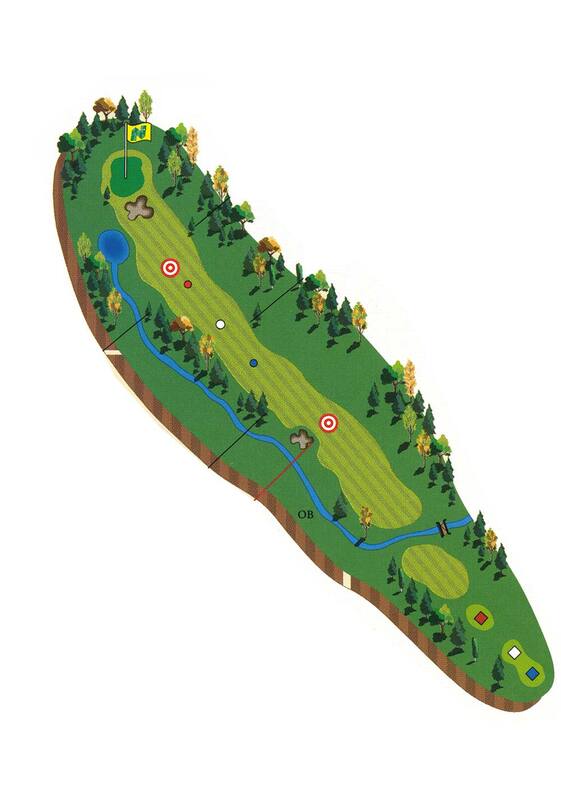 Keep your tee shot to the right to avoid the stream that meanders all along the left and crosses in front of the green. 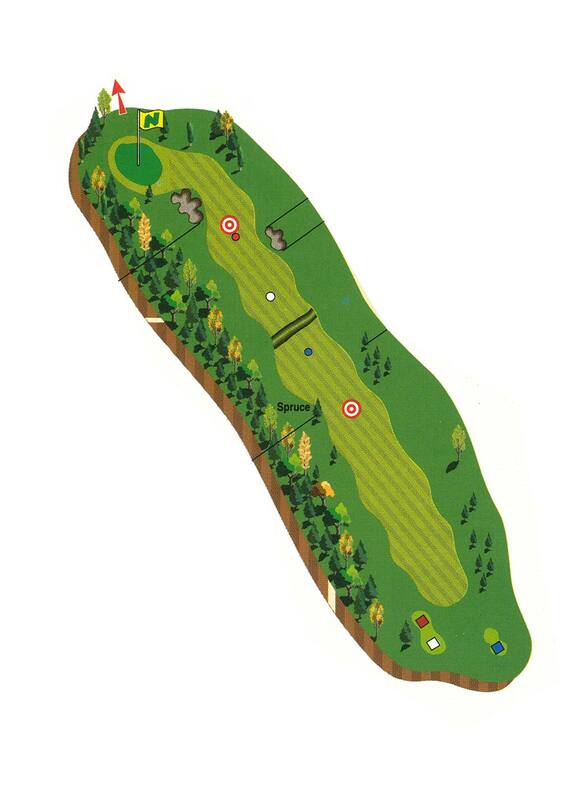 Like #10, play approach shot to the front left of the green and let the ball feed to the right. Even the very best players are not too disappointed with a bogey here. Named after the farm house that sat where the tee is now, this innocent little hole has killed many good rounds with its slick putting surface which slopes from right to left. 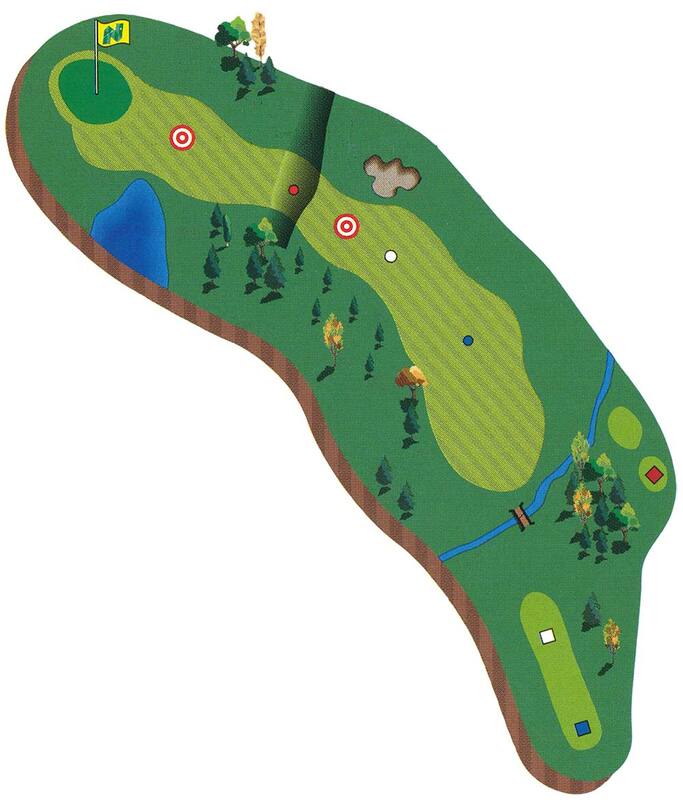 The tee shot must land on the front right corner to have a chance to feed to the pin. Take a 3 and run to the last hole! Left of centre off the tee leaves a straightforward approach to this large two tiered green. Be careful not to drive into the pond that crouches in from the right about 220 yards from the white tee. 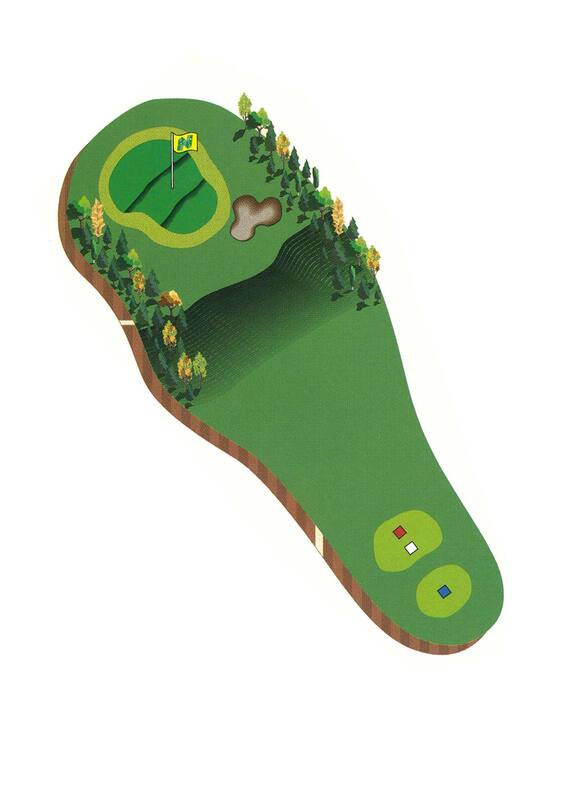 There is a last birdie available here for the good wedge player that keeps the approach shot under the hole.